A mix of geography and territorial uncertainty leaves Tajikistan facing a unique blend of militant violence. International attention might have been focused on developments in Afghanistan recently, but it’s not the only country in Central Asia that is faced with a threat from radical Islamic groups. The International Crisis Group recently released a comprehensive report on Tajikistan’s vulnerability to insurgency threats and Islamic radical groups in Central Asia. Tajikistan is often overlooked by foreign policymakers in light of the risks and opportunities associated with its neighbours. But despite this, Tajikistan’s geostrategic position in Central Asia warrants greater international attention. The picturesque mountainous country is landlocked in an uncertain neighbourhood straddling Afghanistan to the south and China to the east. Add to this the less evaluated, but more complex, relations with Kyrgyzstan to the north and Uzbekistan to the west, and Tajikistan’s regional importance becomes abundantly clear. Following the end of tsarist Russia in the early 20th century, the new Soviet rulers aimed to appease restive areas in Central Asia by granting greater autonomy through the creation of socialist republics. In reality, these republics were independent only in name. In an attempt to ingrain collective harmony in the region and root out local resistance groups, Moscow redrew historical boundaries. The result was fractured new republics with ethnic groups and tribes cut off from each other. Uzbekistan was created as a republic in 1924, and within its borders was an autonomous region of Tajiks based in Dushanbe (the current capital of Tajikistan). Tajikistan wasn’t created for another five years – but its break from Uzbekistan wasn’t complete, or without its complications. The eastern part of Uzbekistan, including Samarkand and Bukhara, remains heavily populated with Tajiks. This concentration of Tajiks in eastern Uzbekistan has stirred up national sentiments in both countries for decades, which have manifested itself into state conflict on a number of occasions. 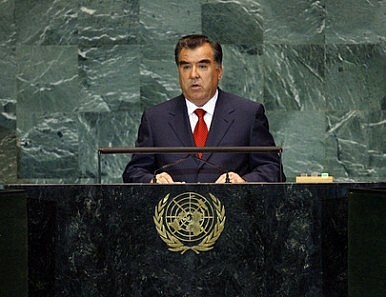 Fast forward to the present day, and Tajikistan’s security situation remains unstable. President Emomali Rahmon has ruled Tajikistan since 1992, and has been privately described as a corrupt kleptocrat by US officials. Rahmon, however, is a savvy politician who is keenly aware of his nation’s strategic importance in light of the mission in Afghanistan. He has ruthlessly cracked down on Islamist militant groups within Tajik borders and heralds his government as a modern Islamic state. The fact that human rights and press freedom continue to toil in the same category as the world’s most despotic regimes is hardly a secret in international diplomatic circles, but – as with Uzbekistan – security seems to be the trump card, at least for now. Tajikistan continues to face a unique blend of militant violence due to its geography and still disputed boundaries with its neighbours. The government in Dushanbe blames intermittent spikes in violence and terrorism on the Islamic Movement of Uzbekistan (IMU), which is largely based out of Tajikistan and northern areas of Afghanistan. The IMU has a stated goal to create an Islamist caliphate in Central Asia extending from Ashgabat to Bishkek. The IMU, which was founded in 1991, has fought and trained with al-Qaeda, notably along the notorious border region separating Afghanistan from the Federally Administered Tribal Areas in Pakistan. Despite their nuanced differences with regard to doctrine and endgame, the IMU continues to be affiliated with al-Qaeda. In October 2010, Tajik forces discovered an IMU training camp in the Rasht Valley and arrested foreign militants from Pakistan, Afghanistan and Chechnya. But this wasn’t before a prolific jailbreak two months earlier in which 25 militants escaped from a maximum security prison. The incident was deeply embarrassing for Rahmon’s government, and induced both derisive and concerned reactions from the international community. The ICG report accurately notes that Rahmon has been largely successful in pushing the IMU beyond Tajikistan’s borders and into Afghanistan, but warns that a resurgence of the group could arise at any time. The report claims that ‘conflict is moving closer to the 1,400 kilometre Afghan-Tajik border’ and that Tajikistan has ‘almost no capacity to tackle a dedicated insurgent force.’ Compounding these concerns is the planned drawdown of US forces in Afghanistan, which will likely result in Washington focusing its reduced counterterrorism resources on the restive southern region bordering Pakistan. While the IMU and insurgents based in the Rasht valley attract most of the attention, the ICG report cautions that Tajikistan is also at risk of a new ‘homegrown’ emergence of jihadi militants. Rahmon’s ability to continue selling his country as a secular and modern society appears to be falling on deaf ears as the younger generation of Tajiks are increasingly removed from the viscous civil war that pitted the current government against Islamists from 1992-97. The continued repression and corruption of so-called ‘secular’ regimes in Uzbekistan and Kyrgyzstan hasn’t helped in dampening a regional Islamist movement either. Tajikistan is particularly vulnerable to narco-terrorism as a transit point for Afghan-origin opium to China and Russia. The ICG notes that ‘billions of dollars of drugs pass through Tajikistan’ on an annual basis. While the central government is suspected of pocketing much of the drug profits – which is an enormous corruption problem in itself – there’s a large share that continues to nourish militant groups with connections to the Afghan Taliban. What can Tajikistan do to change course and immunize itself against future conflict and a potential return to civil war? First, it needs to take concrete steps to address the issue of corruption in Dushanbe, especially with regard to the narcotics trade. But while the ICG report notes this recommendation, it needs to be more fulsome and expansive. It isn’t sufficient to limit anti-corruption reform to drugs and security. In this respect, the international community, led by the United States and supported by Russia and China, should tighten the screws on Rahmon by diversifying its aid to Tajikistan to greater incorporate sectors such as education and the rule of law. Second, while it’s essential to work with the United States, Russia and China, it’s perhaps of even greater importance for Tajikistan to increase its engagement with its neighbours in Central Asia – Afghanistan, Uzbekistan and Kyrgyzstan – in order to work towards a regional solution to what is evidently a regional problem. Finally, the government should take advantage of the IMU’s recent – and perhaps temporary – movement outside of the country to open a dialogue aimed at mending relations with militants associated with IMU, as well as emerging Tajik nationalists. Are Pro-Government Militias Helpful in Defeating the Taliban? Tajikistan’s Security CurseIs the Taliban’s Former Capital Ready to Welcome Them Back?India, US Conduct Anti-Submarine Warfare Drill in Indian OceanWith Hanoi in the Rearview, Will Kim Jong Un Turn to Russia?